Day 1 to Day 13 of the menstrual cycle is characterised by prolific growth of follicles in the ovaries which is triggered by the action of FSH and GnRH. This is called the follicular phase. During this phase a batch of the primordial follicles develop into primary follicles. Which in turn grow into secondary follicles. 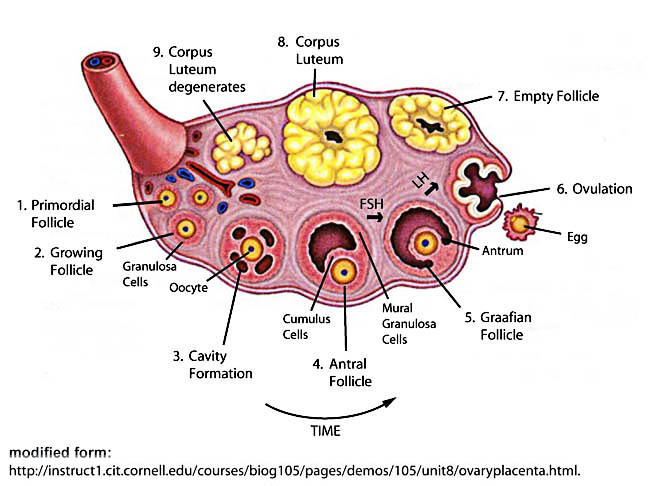 The secondary follicles grow further to form pre-antral follicles. Around Day 3 of the cycle a small cavity is formed inside the growing pre-antral follicles. This fluid filled cavity contains an immature egg and is called Antrum. The follicles bearing Antrum are now called Antral Follicles. These antral follicles will continue growing. One of them will form a Graafian follicle which will ovulate on day 14 triggered by a LH surge.An antral follicle is a resting follicle and appears as a small fluid filled sac which contains the immature egg. These follicles can be measured and counted on cycle days 2, 3 and 5. 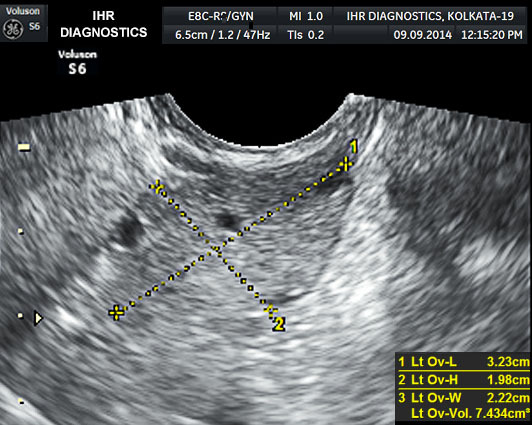 With advancement in ultrasound technology it is now possible to count antral follicles though Trans Vaginal Ultrasound. High –End Ultrasound scanners like G.E. Voluson S6 enables us to easily detect fluid filled Antral Follicles. Even a few millilitres of fluid in the antral follicle can produce a measurable echo that can be detected by its highly sensitive sensors. Follicles between 2 and 5 mm can be visualized and counted. The antral follicle count or AFC must be done when the follicles have not begun to grow. Thus it is scheduled day 2, 3 or 4 of the cycle. Initially the ovarian volume of both the ovaries is calculated. Further the number of small antral follicles in both the ovaries is measured. These follicles could vary in size from 2-10 mm.Because there is not a huge variation in follicles from month to month, this test is a good indicator of the number of follicles and thus eggs which can be responsive to stimulation. AFC count is a major predictor of the ovarian reserve and could reflect the size of the remaining primordial follicle pool. The volume of the ovaries also correlates with ovarian response. The volume of each ovary is calculated using the formula (Ovary length x Ovary width x Ovary height x 0.5). The Normal ovarian volume of both ovaries combined is 10 ml. Women with small ovaries (volume of less than 4 ml) have a poor ovarian response.